Associate, profesorado (for secondary school teachers), licenciatura (licentiate), magister (artium and scienciae), M.D., D.D.S, doctorate. Architecture, business administration, clinical nutrition, dentistry, economics, education, international relations, law, medicine, political studies, public accounting, psychology, social sciences. 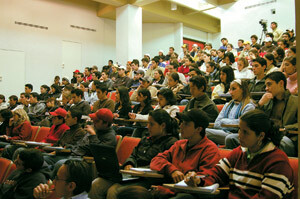 The academic year in Guatemala begins in January and ends in November. Undergraduate programs operate on a semester system; graduate on a quarter system. Most undergraduate programs have a six-week semester break, from the beginning of June to mid-July. Commencements are in May and November. UFM targets the brightest students for admission and it has the most rigorous entrance requirements in the country. The University is emphatic that selection of students be based solely on academic criteria. No information on ability to pay, ethnic, religious, or other affiliations is requested at any point in the admissions process. Students of all religions are represented, as are members of Guatemala's Maya ethnic community. Women generally comprise between 47% and 50% of the student body. Spanish. Knowledge of English is required of all students at the licenciatura level (acceptable TOEFL or ESLASH score is a degree requirement). Students at this level are expected to be able to handle reading assignments and lectures in English. Many key texts used at the University are available only in English and this is often the language of instruction in seminars, courses and lectures given by visiting professors. Board of trustees (fifty members) and board of directors (nine members).